Bans and Restrictions Restrain Asbestos Market Growth | Merchant Research & Consulting, Ltd.
Asbestos has a long history of application. There is also already a rather continuous history of asbestos phasing-out or elimination. 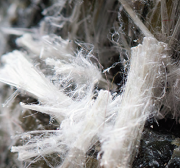 Despite a couple of million tonnes still in annual production by a limited number of countries, the asbestos market curtailment is an ongoing and inevitable process, which though may take years to come. This process is multifaceted and complex. First, there are total bans to use asbestos in numerous countries. For instance, 38 out of 53 European countries banned asbestos. Other countries worldwide are just following suit. The recent example has been Brazil, which was the third largest asbestos producer in the world, after Russia and China. In November 2017, the Brazil Supreme Federal Court banned mining, processing, distribution, and marketing of chrysotile asbestos in this country. Due to the highly interlinked character of modern markets, it has immediately affected the US chloralkali industry. The US chloralkali industry is the main consumer of Brazilian asbestos, (US asbestos imports from Brazil accounts for about 300 tonnes per year). It is interesting that despite the availability of stringent asbestos-related legislation, asbestos has not been banned in the USA, though the chances of passing the asbestos-banning law are very high. Second, asbestos has become a subject of various environmental and occupational restrictions, as well as litigation cases and lawsuits. For instance, the very recent case against Johnson & Johnson, which was obliged to pay a record $4.69 bn to 22 women and their families who alleged the company’s talc, used in baby powder, contained asbestos and caused them to suffer ovarian cancer. Another example is a new legislation imposed in various regions of the world with the aim to protect construction and asbestos demolition workers from being exposed to asbestos at work. There are also numerous cases handled in court which deal with the issue of the damage done by asbestos exposure to such workers. All these stories, litigation cases, and legislative measures actually result in a drastic reduction in asbestos consumption. Most asbestos manufacturers also ceased its production or closed asbestos mines. Of course, there are still possibilities to develop asbestos-related solutions, like the ones by Alliance Magnesium (Canada), which works on a project to recycle asbestos tailings into valuable magnesium metal. However, such technologies only confirm the efforts of asbestos-related entities to diversify its business and walk away from asbestos. More information on the global asbestos market can be found in the in-demand research study “Asbestos: 2018 World Market Review and Forecast to 2027”.